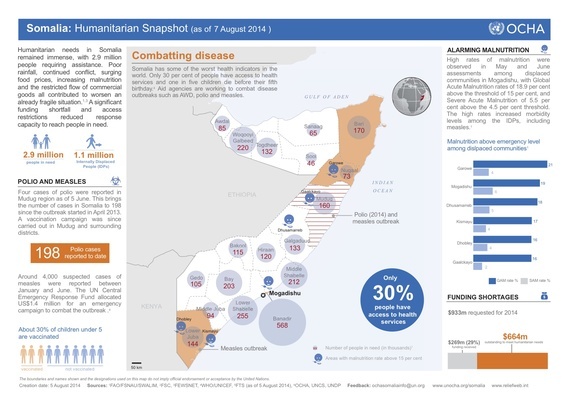 Famine is at Somalia's door once again. In May, U.N. officials alerted the international community that up to 200,000 children under the age of five could die from severe malnutrition by the end of the year. The situation is exasperated by the limited international response. The United Nations lacks the emergency funds needed to stave off a second famine in three years. This year it has met only 25 percent of the $933 million requested from the international community. Greater international mobilization is needed to mitigate this fast evolving reality in Somalia to prevent yet another human catastrophe. According to the U.N. definition, a famine is declared on a three criteria basis when: a fifth of households face extreme food shortages; 30 percent of people have acute malnutrition, and two deaths per 10,000 people every day. Famine results from the triple failure of food production, access to food and the political response by governments and international donors. Somalia is reaching perilously close to this scenario. Indeed the Somali Government sees today's situation as "a precursor to the situation in 2011 in its intensity." 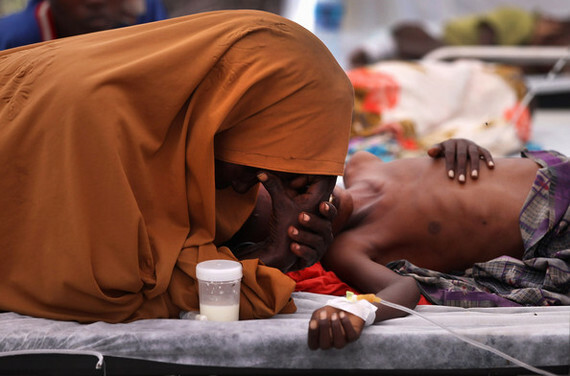 Famine has plagued and defined the lives of children. Between October 2010 and September 2012, famine and severe food insecurity cost the lives of around 258,000 people, including 133,00 children under five. 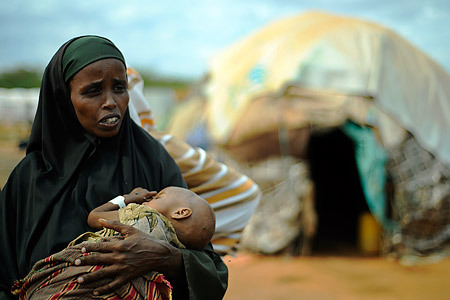 Morbidity, poor child feeding and lack of adequate healthcare practices are the most common causal factors leading to child malnutrition in Somalia. Mothers have watched their children die from starvation. 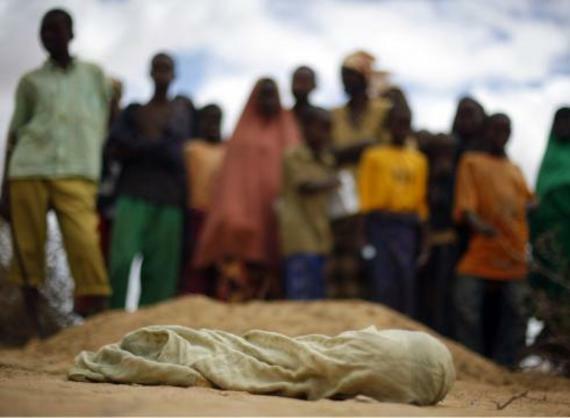 An estimated 50,000 Somali children under five have been identified as suffering from acute malnutrition. UNICEF has received only $15 million of the $150 million requested from donor states, a serious shortfall that is compromising its ability to operate fully and with the required resources. Thus far, UNICEF has been responsible for as much as 70 percent of health services, including medicines, vaccinations, and fuel for hospital generators. Internally displaced persons (IDPs) continue to be the largest group categorised in the Crisis and Emergency phase. IDPs exist on the periphery of society, dependent on unstable livelihood strategies, poor living conditions and sanitation. Concern surrounds the 350,00 displaced living in appalling conditions in Mogadishu, where acute malnutrition and mortality rates have escalated beyond emergency levels and is set to worsen, moving Somalia officially closer to famine. Those that make it to the U.N. displacement camp, 140 kilometres south of Mogadishu, have spent days, if not sometimes weeks, trekking through the torrid and dangerous landscape. The lack of medicine means disease and illness spreads rapidly. After such arduous journeys, many die before they can be nursed back to health. The lack of resources places additional burden on frontline health workers who are scrabbling to save the lives of their patients in inadequate and minimalistic surroundings. Wracked by civil war, Somalia remains one of the most dangerous countries for humanitarian aid workers, and yet remains a priority country in critical need of humanitarian assistance. Food distribution programmes are at risk of shutting down completely. These programmes are essential for allowing aid workers access to territories controlled by Al-Shabaab, who have so far deliberately locked in the local population preventing their access to crucial humanitarian relief. As Al-Shabaab gains ground in the south, international political concern is concentrated around security agenda above that of humanitarian need. It is imperative that the focus remains on both security and humanitarian relief to ensure the immediate needs of so many fragile communities can be met. Philippe Lazzarini, United Nations Humanitarian Coordinator for Somalia, saw the 2011 famine as "a silent drama of tragedy" reflecting a failure to match early response to early warnings. Instead of focusing humanitarian relief around prevention, aid agencies were scrabbling to respond to a crisis that had already swept through communities. The slow release of funds compounded the crisis. This is extremely problematic when trying to contain and stave off mass hunger. The U.N and international community must not wait for statistics to conform to a strict definition of famine before emergency policy is implemented. By then, any intervening response would have already failed those lost to the crisis. As such, donor programming must reflect long-term solutions in order to safeguard livelihoods and insulate communities against future shocks. This means directly addressing the underlying causes of the immediate crisis. Ban Ki-moon, Secretary-General of the United Nations, has expressed his concern that today's humanitarian emergency will not be the last the international community has to witness and respond to. Investment in practical measures that guarantee economic security will be key. This means more concentrated focus around agricultural development initiatives, such as drought-resistant seeds, irrigation, rural livelihood programmes that invest in livestock, physical infrastructure and public intervention to stabilise market failures. In Ethiopia, where over the last decade these programmes have worked successfully, agricultural production has surged, increasing annually by eight percent. Adapting and scaling up such programmes for Somalia will pave the way for a more prosperous nation in the years to come. Suffice to say, change will take time but will be dependent on the international community and aid agencies taking an integrated approach towards development policy and implementation. Somalia's lifelines are already frail and reflect a system under threat. Disease is already claiming the lives of a malnourished and immune-suppressed population. Aid agencies fear that malaria, cholera, typhoid and measles could sweep through the south of Somalia with devastating effect. The message is clear: immediate intervention is needed to avoid yet another humanitarian disaster. 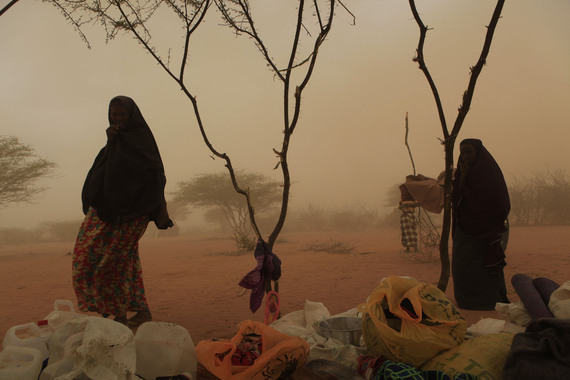 The life path of women and children in Somalia should not be determined by their ability to survive the triple catastrophe of drought, famine and conflict.